I had a brief moment of delusion a month or so ago that my usually torrid (from a “real job” perspective) summer was easing up. A second wave of “business” started a couple of weeks ago and looks to continue at least through the next two weeks. Without time to really research and develop a content-driven post, I thought I’d highlight a few of my favorite blogs and throw in a couple of introspective notes. Of course you can look at my Blog List on the left side of my web page. I like all of these and will at least scan them whenever a new post comes up, though David Beard’s Archaeology in Europe Blog sometimes overwhelms me with the amount of information. However right now I want to mention a few blogs which are largely focused on the Early Medieval/Late Antiquity periods. Burgundians in the Mist is a blog devoted to the 5th and 6th century Burgundian Kingdom. The Burgundians were one of the Roman successor states, first settled as foederati and then carving out their own kingdom. In 534 they were defeated and their kingdom absorbed into that of the Merovingians. This website helps remove them from obscurity. One of the items which makes the Burgundians so interesting to me is that through the writings of Avitus of Vienne we’re provided a window into the struggle between Arian and Orthodox Christianity for Western supremacy. Outside of the Franks, all of the barbarian groupings that entered the former Roman territories were Arian and, one by one, they converted – or were destroyed by Justinian. Grateful to the Dead is authored by Dr. Chris Armstrong, Professor of Church History at Bethel Seminary. The blog is not exclusively about the early Church, which is my main interest, but it has a lot of information about it, as well as the development of doctrine. I’ve only been following it for a short time but have found it very interesting. Magistra et Mater has a blog which is a combination of her work on Early Medieval Europe and her current job as a Librarian (somehow “librarian” doesn’t seem to capture the essence of this – Library Scientist? academic librarian?). I’ve found her posts on the Carolingians very interesting and look forward to more of her work being published. I’m very interested in the role(s) of women during the Medieval period and her work on masculinity includes a tremendous amount of information on this. See her recent post on methods of study regarding the level of freedom women hold in societies for an example. I’ve only recently been introduced to The Lost Fort through the recent Carnivalesque hosted by Jonathan Jarrett at A Corner of Tenth-Century Europe. Gabriele Campbell is a writer of historical fiction and fantasy who has done extensive research on the Ancient and Medieval periods. I haven’t had the time to go through her blog in depth – yet – but from what I can see, there’s a wealth of information. You may wonder why I’ve left A Corner of Tenth-Century Europe so late. Alphabetically, Jonathan Jarrett’s blog is the first on my Blog List and anyone who’s read my blog knows how much I appreciate what he’s put together. That’s because I’m going to use his blog as a segue to another topic. Jonathan’s blog is remarkable for a couple of things. First, and most obvious, is the content. Absolutely loaded with information, not just about the 10th century and his most recent research interest, Catalonia, but about the Carolingians in particular, and Medieval History in general. Also, I’m a huge footnote-chaser and Jonathan includes these liberally. One of the things which characterizes all Medievalist blogs that I’ve come across is the love they have for the period and their work in it. I think this comes across particularly strongly in Jonathan’s blog. I’m certain there are Medievalists out there a bit discontented with their work, or wishing they were doing something else. But you don’t find them blogging. Jonathan recently posted about his trip to the New Chaucer Conference in Siena a month or so ago. The post was interesting enough, but he was kind enough to include a link to his paper on blogging. I’ve read it 3 times. Jonathan’s paper tells a story of how and why he began blogging, and how his blog has evolved. It’s good reading, but it speaks to me because I’m still trying to figure out what my blog is “about.” I know it’s about Late Antiquity and the Early Medieval period and I know it’s very much an amateur effort. But why does it exist? I started it because I enjoy conversations about medieval history and have engaged in multiple online forums related to this, and wasn’t happy with the level/content/something indefinable on any of them at the time. Mixed in with this is my enjoyment of teaching and my hope that I could provide some sort of amateur-professional “link” which other amateurs might find helpful. I’m certainly not a Medieval Historian, but when I get in a room full of them I can generally understand what they’re saying – something which wasn’t true at, say, my first International Congress on Medieval Studies ten years ago where I pretty much sat meekly in the back of the room during sessions. That takes care of the why. How about the content, the what? As some have noted, I read a lot. I thought most of what I’d do would involve posting book reviews. It didn’t take very long to realize this wouldn’t happen. For one thing, while I read a lot, I don’t whip through a 500-page book every week and I feel it’s important to post regularly, at least weekly. However I don’t want this blog to be about my real job, my real life, or anything but medieval history. So reading Jonathan’s paper has me thinking, again, about the purpose of this blog, the message I’d like to communicate. I’m not sure I have one beyond “the Middle Ages fascinate me.” No overarching theme or concept. This will likely result in a continued mixture of posts with a fair level of content, interspersed with those such as this one which include resources and introspective thoughts (nobody should interpret this post as even hinting that I don’t enjoy blogging or am thinking of stopping). And while I don’t want to “post just to post” I find this happening – where, when I’m busy, I throw something like this out (which I can put together in an hour without digging through references) so I can have a post up at least weekly, even when I have nothing to say. Not to worry though. I’ve just started Allen Jones’ Social Mobility in Late Antique Gaul: Strategies and Opportunities for the Non-Elite. I think I’m going to enjoy this, and I expect I’ll have something to say about it when I finish. This book is good enough that it deserves a full review. Unfortunately, I’m swamped and that won’t change until the second half of next week, by which time I’ll have lost my inspiration. So I’ll keep myself to some fairly brief comments. Innes, Matthew, State and Society in the Early Middle Ages: The Middle Rhine Valley, 400-1000. New York: Cambridge University Press, (2000). Pp. 316, xvi. ISBN: 978-0521027168. Despite the title, this book mainly discusses the Carolingian period. Yes, Innes touches on some of the transition from the late Roman and Merovingian periods, particularly in Chapter 6, “Political Power from the Fifth to the Eleventh Century” but the main focus is on the Carolingians. The primary focus is on the nature of power, authority and social structures. Innes chose to concentrate on the Middle Rhine due to the simple chance of source survival. Due to the Lorsch and Fulda source collections, a great deal of information is available for the 8th and 9th centuries from this region. There are several portions of this book which I consider to be most important – at least for me. Above all, Innes believes that power was developed, projected and utilized based on social relationships, NOT Carolingian state institutions. The relationships which defined this type of structure were vertical rather than horizontal in nature – between the royal family and the upper aristocracy and between the upper and lower aristocracy rather than among individuals of roughly the same social class/level. He believes that it isn’t until the Ottonians where political power began to become independent of social relationships. This doesn’t mean that horizontal relationships were unimportant, however they did not play a large role in power politics. Innes provides a pretty fair level of detail relating how these horizontal relationships and expansion of kinship groups can be traced through charter evidence, particularly land acquisitions, however the uses of power are typified by vertical, not horizontal relationships. In addition to the above segments, the book covers those aspects of society which could be considered government institutions such as maintenance of roads and city walls, the royal messenger system and royal levies. Chapter six provides something of a historical narrative as it relates to the evolution of society and how it crumbled in the 10th century. Innes provides one more item to add to what I consider a fairly consistent theme of why rebellions – or what have come to later be viewed as rebellions – happened. Often (I’d like to word this “in most cases” but I haven’t seen – or done – a comprehensive review of rebellions) these do not seem to be a quest for freedom but a search for security. As the system of Carolingian royal patronage failed, violence ensued in a struggle to fill the power vacuum until someone stepped forward to fill the void. The same thing happened in Rome in the 3rd century with the formation of the Gallic Empire, in 5th century Western Europe, and again here in the 10th-11th centuries. Locals wanted security. If the current government couldn’t protect them from either external invaders/raiders or internal violence, then people looked for someone who could, breaking their ties with the previous authority. The use of the term “rebellion” to describe these quests for security can mask what was really going on, in my opinion. This is an interesting, useful book. I think it would make a great book to read with Chris Wickham’s The Inheritance of Rome. And Innes uses footnotes. My only caution is that if you’re looking for something which covers the years 400-700 in any depth, you’ll be disappointed. This is a book about the Carolingians. Wickham, Chris, The Inheritance of Rome: Illuminating the Dark Ages, 400-1000 New York: Viking Penguin, (2009). ISBN: 978-0-670-02098-0. This is the second of two days I’m taking off from work, supposedly to get some things done around home. Unfortunately, I seem to have chosen two of the hottest days of the year. The high yesterday was 95 (35 C) with a heat index near 110 (43 C) and today’s similar. I’ve decided on a new guideline by which to live my life; I’m not working outside when the temperature is more than twice my age – gonna have to change that in a few years or I’ll be working when it tops a hundred. OK, I’m a wimp. Used to love the heat in my younger days. Was gonna mow pasture and did for about an hour yesterday. The question may arise, “How tough is it to mow? 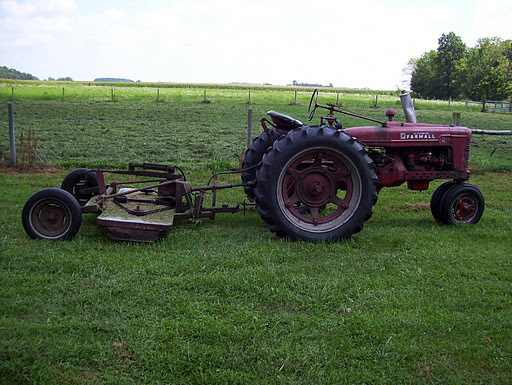 You just sit on a tractor.” When the tractor’s over 60 years old and there’s very little wind, all the heat from the engine block blows back on you. Jonathan Jarrett just offered that I’m a cutting edge sort of guy. I offer you this picture as refutation. Like pretty much anyone who isn’t filthy rich or living in abject poverty, my ability to spend on luxuries has changed over time, based on my financial situation. When I started with this Medieval stuff, I was a year or two removed from buying a house and was undergoing the inevitable adjustment from renting and having about as much pocket cash as I wanted to spend without having to worry about it as long as I didn’t hop a plane to Vegas every week, as well as the ability to “save up” a fair chunk of change over a month or two by skimping a bit. The mortgage changed all that. Suddenly I couldn’t just go out whenever I felt like it, blow money on anything that caught my eye, etc. I needed a budget. Now I’m living large again (relatively). The mortgage is paid off (though I bought a new car to celebrate so there’s still a decent payment but nothing like before). If I decide I want to buy 60 books at Kalamazoo, I can do it (though this has still impacted my budget a bit the past few months – just finished paying off the CC bill). Today, if I see a book that’s selling for $30 in paperback and $50 for hardcover, I’ll likely buy the HC – they are much more durable. So pretty much all of what follows goes back a couple of years before this recent, happy state of affairs. The good thing is I’ve retained a fair amount of my mortgage-induced discipline. I know where my money’s going now. I’ve always read a lot, ever since I was a kid. Back then, and until I was 30 or so, it was all fiction. SF/fantasy, action/adventure/thriller, some westerns – I still have a lot of Stephen King and Zane Grey (I’ve given away almost all of my Louis L’Amour and Dean Koontz). One of the big shocks when I got into history was the price of books. Instead of paying $5.95 for a mass-market Pb, I had to shell out $20 at a minimum. Initially I was just going to get a few books and stop. The goal was to write fantasy in a medieval setting. I wanted to get a feel for the period and not make any truly egregious errors. My world had to be internally consistent. As I’ve mentioned elsewhere, within a couple of years, my priorities changed. I think I really started looking into this when I realized I couldn’t just buy off the shelf at the local bookstores. Once I really got into this, I had to set a budget. For over ten years that was $100 a month. I won’t say I always kept to it, but I did better than I would have thought when I started. I tried to balance a month where I may have gone over by cutting back afterward and I work pretty hard on not buying books for the 2-3 months before Kalamazoo. With this budget, I needed to work a lot harder at my selection. The first couple of years I was buying off the shelf at Barnes & Noble or Borders. It has been a very long time since I have been able to find what I want at those stores. For a time, rather than purchasing online, I’d order things through the nearest B&N. Finally, on January 15, 1998 I went Amazon, buying The Battle of Hastings by Stephen Morillo (ed.) for $27.95. From that point, Amazon has been where I buy many of my new books, though over the past couple of years I’ve started moving toward purchasing direct from publishers due to conference and other discounts. This is largely a repeat of something I posted on a Library Thing Discussion group a year or so ago. VERY IMPORTANT DISCLAIMER: What follows is an ideal. I’ve never followed it 100%. In particular, used bookstores completely overcome my good intentions. The International Congress for Medieval Studies at Kalamazoo hasn’t been real good for it either. I have four main sources from which a title first comes to my attention. One is from the academic community. Now I’m not a member of the academic community (in history) but I lurk around the edges. I look for mentions in mailing lists such as Mediev-L and reviews in the Bryn Mawr Review and The Medieval Review. Books are also sometimes mentioned in the academic journals I read. And while I didn’t mention it in that post, one of things I do while I’m reading and taking notes is keep a separate sheet of paper on hand to write down references I want to take a closer look at. A second is that due to attendance at conferences I receive catalogs from probably a dozen publishers – Brill, Boydell & Brewer, Harvard U Press, Oxford, Cornell, Medieval Institute, etc. When I receive those, I browse through and circle titles/summaries that catch my eye. Third is Amazon.com recommendations. Probably 2/3 of what they recommend is garbage but some titles will come up. Fourth is Library Thing. I scan profiles of anyone who triggers my tag watch and I’ve gone through the tag pages of most of my own tags and looked at the libraries of people who have a lot of similar tags. And there are books mentioned in the LT discussion groups. I suppose a 5th is if someone e-mails me, PM’s me, sends me a Facebook message, I read it on a blog, etc. But I don’t have a “system” for these – it sort of just happens. So this gives me my initial list. From this I take books and add them to a spreadsheet of my books at home; a 2-worksheet Excel file with one worksheet of what I own and one of what I don’t, my wish list. I also label/tag them and add them to my Library Thing Wish List. When it comes time to thin my selection – generally when I’m ready to buy more books – I get serious. I take the books that rank highest on my list, usually based on what I’m reading right now, and get to work. First I’ll check Amazon product descriptions and reviews. There are a few reviewers on Amazon who, based on past reviews, I trust. I won’t generally eliminate a book based on Amazon reviews but I will move some into the “buy” column and not go further. Second is Academic Reviews. I’ve already picked out books through Bryn Mawr and Medieval Reviews (mailing lists). If I pick a book out based on those I save the e-mails as a text file – BMRxxx (when I started this there was no Medieval Review – it was all part of Bryn Mawr, hence the file name). I’ll read the review again and generally this moves the book into the buy column. While I’m not a member of the History Academic Community, I’m fortunate enough to be a member of the Academic Community in “nothistory” and have access to JSTOR through my institution’s library system. I do online searches of the American Historical Review, English Historical Review and Early Medieval Europe looking for reviews. I also subscribe to Speculum and The Journal of Late Antiquity. If I don’t find a review there (usually I do) I’ll go to Google and look for other reviews. If it’s a primary/contemporary/period source I’ll look for a general description of the work through various sources ranging from Wikipedia to course syllabi posted online by professors. Wikipedia receives some bad press and I’d never recommend it as someone’s only source for something, but it often makes a pretty decent starting point. Keep in mind that if you aren’t a student, or don’t work for an academic institution, your local public library may have JSTOR access. It’s definitely worth checking out. Once I have my “thumbs-up” list I go back to Amazon which is where I make most of my purchases. Now if a book has a high price – $60 or more – I won’t delete it from my list. First I’ll check Abebooks. It’s surprising how many books are listed for big dollars on Amazon that, in another bookstore, are at half or even less. If it’s sitting in a private bookstore and has been on the shelves for five or more years, the price may be marked down. I’ve bought books listed at over $100 on Amazon for less than $35 on Abebooks. I’ve also used AddALL and others. Keep in mind that in buying books through these sites that provide a market for book sellers, unless you’re fortunate enough to find multiple titles at one store, you pay S&H on each item so that’s a consideration. If a book’s too expensive for me to buy right now I won’t delete it. It’ll just go back into the herd in case either a paperback edition comes out or if down the road it gets discounted (usually by someone other than Amazon). And it may be in my institution’s library. I have bought books priced at over $60 but it’s rare. In that case it has to be something I feel I really need. Also, very rarely an edition isn’t available in the US but is in the UK. I’ve only done this a couple of times but I have bought books this way and paid the overseas S&H. If it’s a recent pub I won’t because I figure it’ll probably show up soon but if it’s 3-4 years old or older I will. If you’re looking for something that’s unavailable or no longer in print, don’t forget the Internet Archive and other online sources. There’s an astonishing amount of free public domain stuff out there. If I can, I like to get a modern version of a source complete with notes and annotations but I’ve downloaded a fair number of PDF’s too. In a used bookstore all these rules go out the window, but at a used bookstore I’m generally at a much more reasonable price so I feel justified in being less selective. Besides, I just like supporting privately owned used bookstores. You’ll notice that I haven’t addressed judging a book based on content; footnotes, author, bibliography, date of publication, etc. To get into that would require its own post – I have some guidelines there too. But part of the problem is that quite often, through buying on line, I never get to look at the book so I end up relying on what I’ve included here. So that’s it – my book-buying “system.” Not perfect, certainly, and I expect I’ll continue to refine it, but it has been helpful to me. As always, suggestions from others are welcome. 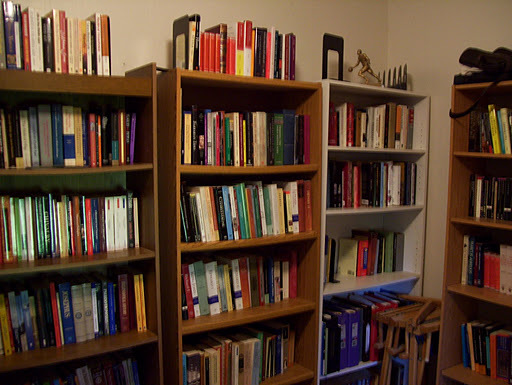 1 If you’re curious what books I have – or what to buy me for Christmas – you can take a look at my collection on Library Thing. A couple of weeks ago I posted a request for suggestions of books which might replace William Manchester’s A World Lit Only by Fire as an assigned textbook for students taking the Advanced Placement (AP) European History Course. At the time I posted this I had not fully studied the details of the course, which would have provided a little more direction on what kind of materials would be useful. The AP European History Course, which is where Manchester is generally used, is designed to cover European History from 1450 to the present. In essence, little of it deals with the Middle Ages. This doesn’t stop Manchester from being a terrible choice for students to read, however it does change the type of texts which would be of most help. You can find out more about this course at The AP European History Course Website. The AP Program is a very good thing and I completely support it. I’d just like to see something other than Manchester used for this course. One of the problems is that teachers have a hard time finding something students will read. They will read Manchester. Little wonder as it seems to have a focus on the seedy, raunchy side of life. And, at least for the Medieval Period, it’s largely a work of fiction. Hopefully we can come up with some good alternatives. I haven’t received a great deal of response to this request to date but I want to recognize those who did contribute, even where that contribution was in response to my overly vague request and covered the entire Medieval period, not just the years from 1450. These books may have some usefulness for teachers researching appropriate materials to assign for the AP World History Course. The Penguin History of Medieval Europe by Maurice Keen – I haven’t read this, just heard good things about it as an overview. Larry was responding to my request for good books that provided an overview of the entire Medieval Period. However these are inexpensive and may find use, either in the European History or, more likely, the AP World History Course. At the very least, if someone has read Manchester and would like a more balanced view of the period, (I recently had an e-mail from a High School student making this very request) these are inexpensive, fairly readable options. Joan of Arc: Her Story by Régine Pernoud and Marie-Véronique Clin – This book includes primary source documents as well as short essays on various topics – Joan in Cinema, for example. These essays would make good starting points for paper topics. Elizabeth was more familiar with the class. She felt that both Cippola and Huppert might make good overviews. She mentioned that Huppert had some issues but nothing on the scale of Manchester. She also felt that for something like this, providing a “slice of life” might be better. Pernoud/Clin and Wunderli fit here and she felt some of Steven Ozment’s books might also work. I hope to get more contributions as time goes on. For now I’ll attach this post as a link at the end of my Manchester review and try to keep updating it. Also, if anyone would like to provide a brief summary of any of these, I’d welcome it – I haven’t read any of them though I have read Pernoud’s Joan of Arc: By Herself and Her Witnesses and found it quite good – she links her narrative with a lot of source documents. As I mentioned in my Manchester review, beyond the content, I have a problem with assigning a book to AP History students that doesn’t footnote. NOTE: This page is primarily for HS history teachers (and possibly some parents). I thought that the Amazon.com links would make for the simplest and most valuable use but if you prefer that I put together a proper citation list at the bottom of the page, I can do that as well. Just leave a comment or e-mail me. I don’t know exactly how these two services work in Blogger but you may have received a notification of a post I put up on Sunday and tried to go to it, only to find it was no longer there. That was a mistake on my part which you can read in more detail in the comment section of the Carolingian Land Settlement post which I’ve put back up. I apologize for any inconvenience this may have caused. As I mentioned in the comment section of my Carolingian Lay Literacy post, what I knew of aprisio two weeks ago could have been written on the back of a book of matches. I simply thought it was a strategy the Carolingians used to encourage people to settle in underpopulated areas. I had no idea how it worked, what kind of benefits settlers would have – I didn’t even think about it being royal lands (though I hope I’d have been able to figure that one out if I’d given it any thought – be tough for even Charlemagne to get away with settling folks on someone else’s lands). If you’d asked me to sum up aprisio in one statement I’d have likely muttered something about it being similar to The American Homestead Act and shut up fairly quickly. In short, aprisio evolved in the aftermath of Charlemagne’s Spanish expedition of 778. The expedition has been viewed as a failure historically and I suppose by Charlemagne’s standards it was, but it did yield some benefits. One was the inspiration for the Song of Roland. While the King would never appreciate that, he seems to have placed some importance on the territories in Northern Spain that he gained, a large portion of what is now Catalonia. Much of the region was underpopulated, basically wasteland, and Charlemagne initiated aprisio grants where settlers would clear the land and bring it to productivity and he would allow them to hold it. The use of this term is unknown outside of what is today Catalonia. Among these characteristics which Jarrett challenges are that aprisio was; always accompanied by extensive privileges; in any way tied to the Visigothic thirty-year rule of law; awarded largely to Hispani 6; created and used for military purposes to counter the influence of distant and independent counts and; exclusively the prerogative of the Frankish King. As I expected, based on the quality of his blog posts, Jarrett proceeds with his arguments through a detailed examination of the source materials, in particular charters. As this is an area I’m relatively unfamiliar with, it’s difficult for me to pick apart arguments, or to really evaluate the quality of Jarrett’s article, except for appreciating the detail and acknowledging the extensive use he makes of sources. However there are a couple of exceptions to my ignorance. One is related to the Visigothic thirty-year rule. This rule is not unique to the Visigoths and may be found in accounts of disputes in various regions. Basically, if someone held land for 30 years, their possession of it could not be challenged (this is a bit simplistic – there are exceptions to this but it’ll do for this discussion). It appears to have originated in Roman Vulgar Law. 9 Related to this, there has been a belief among historians that aprisio holders could not defend their landholding rights until the thirty years had passed. Dr. Jarrett relates how this came about, originally based on an 812 case where a group of settlers appealed to Charlemagne that their aprisio rights were not being respected by the local counts. (326). Their grant dated from 780 and in addition to the language of the grant, they invoked the thirty-year rule as well. This does seem to be an odd thing for historians to believe. There are plenty of examples among the Franks, Lombards and Visigoths of the thirty-year rule being used in land disputes, and plenty of disputes where it was not. The aprisio holders certainly cannot have been left to fend for themselves without recourse to challenging an infringement of their property rights for 30 years. If Charlemagne really wanted to grant them land, that seems a strange way to do it – giving a charter without it meaning much for thirty years. In a dispute, both sides will throw the kitchen sink at each other. The use of the thirty-year rule in this case certainly seems to have been no more than additional ammunition in defense of their rights, not something which they would have been defenseless without. In the opening of this article Jarrett highlights Cullen Chandler’s 2002 EME article (see note 3) and you could be left with the impression that his article is written as essentially a counter-argument and that the bulk of the criticism is directed toward Dr. Chandler. This is untrue. While Chandler may have provided, at least in part, the motivation for this article, several of the items Dr. Jarrett takes issue with, such as that they only originated from Carolingian Kings, are not positions Chandler takes. I also think it’s important to note that the period Chandler’s article addresses ends in 897 while Jarrett continues the discussion into the tenth. However there are some significant areas where Jarrett disagrees with Chandler and I’d like to explore two of these. Chandler believes that the rights and privileges of aprisio grants had become so customary, so well known, that they no longer needed to be included in the language of the grants. Jarrett has some problems with this argument, as do I. Jarrett’s argument has several aspects. First and, to me, most important, is that immunities granted to religious institutions continued to be fully stated. (327) This seems to be a matter of simple logic. If putting everything in writing became less important for aprisio grants, wouldn’t it be expected to carry over to other areas? Jarrett also believes this may be an error caused by a tendency to see aprisio in grants to Hispani which are not aprisio. However Dr. Jarrett does provide some support to Dr. Chandler in a discussion of 10th century grants. “The word aprisio is used so widely, however, that it obviously had a meaning that was fairly well understood, and a few charters make it clear that there was a more systematic and even legalistic idea of what the claim involved than the simple clearance envisaged in the royal documents.” (335) This doesn’t exactly say that there were commonly recognized but unwritten rights associated with aprisio but it comes awful close. NOTE: See Dr. Jarrett’s comment below – I misread the intent of this statement. I believe the argument that if aprisio grants were meant to carry unwritten privileges then other grants of immunity would likewise show a lack of specificity in their language is a sound one. There is a second question that came to mind for me as I read this. In later disputes concerning aprisio land, did a) those holding land by aprisio mention these unwritten privileges and b) were these privileges recognized in the proceedings? I don’t know the answer to this and certainly a dispute taking place in, say, 890 can’t tell us much about Charles the Bald’s intentions when he stopped referring to privileges in these grants in 847, but it would add some weight to the “customary but unwritten privilege” argument. This is not unpersuasive, if relatively unprovable. Put more correctly, I think it’s a reasonable, though certainly contestable, interpretation of the evidence (what can you actually “prove” in history anyway?). One problem with the theory is that aprisiones were generally given the right to sell their property. It would still ultimately belong to the king, but would have another landholder. If countering comital power was a major concern, then it would seem that allowing the alienation of land to either an ally of the local count or the count himself might have been restricted. For my money, I think it very possible that Charlemagne and his successors saw this as a way of maintaining their influence in the marcher lands, as Chandler proposes. I question how much impact it would have had though. A belligerent count could create much more trouble for a landholder than the king over 600 miles (a thousand kilometers) away, no matter who he held his land from. I have a feeling most Hispani and aprisiones likely paid more attention to the local guy who had armed forces at his call, may have controlled the local mill, etc., than to a distant king. To me the military force aspect would have been less important as a check than the appeal to justice since in that case a king could basically overrule a count about something taking place in his back yard and would also find out much more quickly if local authorities were getting out of hand. I’d like to propose an interpretation of my own for this. At the time of the first aprisio grant, Charlemagne had just finished a failed invasion of Muslim Spain. Clearly he did not achieve all of his objectives and I don’t think it’s a stretch to conjecture that he at least had thoughts of going back. The aprisio grants – as well as the grants to Hispani – would have provided him with a force located close to his target which he could call up for military service without requiring them to attend the mallus. This is pretty much opinion on my part without any basis in the evidence (that I’m aware of) but it seems like it might be an option. 1 Jarrett, Jonathan, ‘Settling the kings’ lands: aprisio in perspective,’ Early Medieval Europe 18 (2010), pp. 320-342. 2 This is where Google and Blogger and the Internet get in the way. I wanted to title this post: “Northward Ho! A Carolingian Homestead System”. But not mentioning aprisio in the title would have been bad – and including the word “ho” for search engines to pick up would have been worse. 3 Chandler, Cullen J., ‘Between court and counts: Carolingian Catalonia and the aprisio grant, 778-897,’ Early Medieval Europe 11 (2002), pp. 19-44. 4 I’m not sure if this even matters but I want to mention that at the time he wrote his 2002 article, Cullen Chandler was not yet Dr. Chandler but a Phd. candidate. I have no idea what the protocol is for this – maybe by even mentioning it I’m screwing up. I know that advanced doctoral students will – and in this case certainly did – provide quality work. The only thing I can go by is consistency. I tried to include education levels and affiliation in my Kalamazoo session write-ups so I wanted to include it here, somewhere, but hopefully without in any way inferring that Chandler wrote anything but a quality article, or that he should be judged any differently from any other author. 5 The detail with which Dr. Jarrett explores the evidence and my own propensity toward over-writing combined to create a slightly ludicrous situation. My initial foray resulted in a post of 532 words – at which time I had only gotten to the 4th page of the article. This edition is, I hope, a bit saner, though it’s still my longest blog post to date. My goal is to discuss some things of interest and encourage people to read EME, not recreate the entire article in Geekish. 6 Hispani is a term used by Carolingians for residents of Spain who fled Muslim territories to live under Carolingian rule. It has been explained that often these were people who supported the Carolingians during the invasion and, once it was beaten back, found the concept of remaining under Muslim rule untenable. NOTE: See Jonathan Jarrett’s comment below regarding the correct use of the term Hispani. 7 Once I got into the details of the charter evidence I nearly decided not to post this article. I am completely unfamiliar with this evidence and am unable to comment on it other than to state that Jarrett footnotes extensively, in particular referring to R. d’Abdadal i de Vinyals (ed. ), Catalunya Carolingia Vol. II: els diplomes carolingis a Catalunya, 2 vols (Barcelona, 1926-52). In fact, if Dr. Chandler had not responded to my Carolingian Lay Literacy post, I may not have written this at all. However this seemed like a good way to start an interesting discussion and, from a selfish perspective, I have a feeling I may learn a lot from these two gentlemen and hopefully others will as well. And I should note that Chandler’s 2002 article also uses sources extensively, though his interpretation of some of them are different. 8 This is a major theme of Dr. Chandler’s 2002 EME article and one I really would like to give more time to. Chandler offers a summary of his argument for this on pages 22-24 and also in his conclusion (43-44) but touches on it throughout. 9 See Davies, Wendy and Fouracre, Paul, eds., The Settlement of Disputes in Early Medieval Europe, (Cambridge, 1986) ISBN: 978-0521428958, p. 275. The thirty-year rule is also discussed in several cases in this book, in particular in; “Dispute Settlement in Carolingian West Francia,” by Janet L. Nelson, pp. 49-51 and; “Land disputes and their social framework in Lombard-Carolingian Italy, 700-900,” by Chris Wickham, pp. 110-111. 11 In Chandler (2002) for discussion on; appealing directly to the king for justice, see pp. 22-3 and p. 27; military service owed to the king, see p. 25; statement that they will retain their grant only so long as they remain faithful to the Carolingians, see p. 30. 12 Even with the length of this post, I haven’t completely covered this article. Dr. Jarrett also includes a substantial discussion of what aprisio, even with the inconsistencies he attributes to it, can teach us about patterns of land settlement. I haven’t touched on this here, though it’s one of the most informative sections of the article. Again, I encourage people to read the full article, as well as Dr. Chandler’s. I had an e-mail request about subscribing to my blog through an RSS Feed and apparently Blogger allows that so (after I got done being very pleased by the request) I’ve added it. I’ve never been an RSS Feed before (subscribe to plenty at work) so if it isn’t working correctly, please let me know and I’ll see what I can do. I’m hoping the “Really Simple” part of the acronym is correct.